I will show you how to download Hiren's Boot CD 15.2 and how to prepare a memory stick with Hiren's Boot. Hiren's Boot is the most used tool by the technical personnel because it has several systems of beginning as the mini Windows XP, beginning Linux and a beginning D.O.S this added to a great quantity of tools (which I show you clearly in several tutorials that you will find in this page) they do it the suitable tool for any technician in computer science. 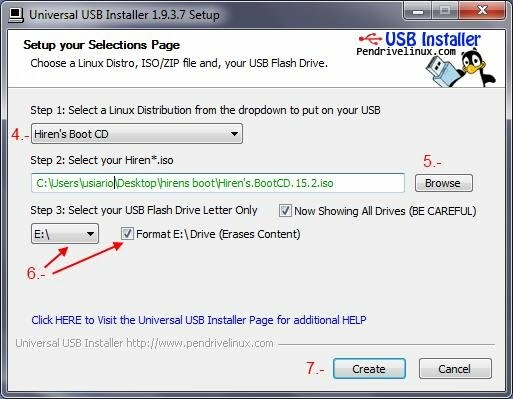 And finally we will need to download Universal USB Installer here (wait 5 Seconds and click in the yellow button) if the link isn't available we will search in the Universal USB Installer in the following page here. In the drop-down menu we select the option Hiren's Boot CD give him click to the button browser and look for ISO in the office in the folder Hirens Boot. We select our USB memory and select the cabin "We will format? :\Drive ace Fat32 (the information will be erased of the USB memory). Finally we click in the button "Create "